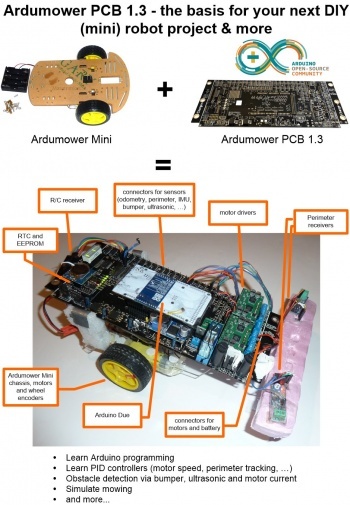 Difference between revisions of "Ardumower Mini"
The Ardumower Mini can run the same software as the 'big Ardumower'. For the PCB, it's recommended to use PCB 1.3. For further building instructions, see PCB1.3 and for uploading the software, see Azurit Firmware. If you do not want to use PCB 1.3, you can (with some limitation) connect the components directly to the Arduino Mega as shown below. 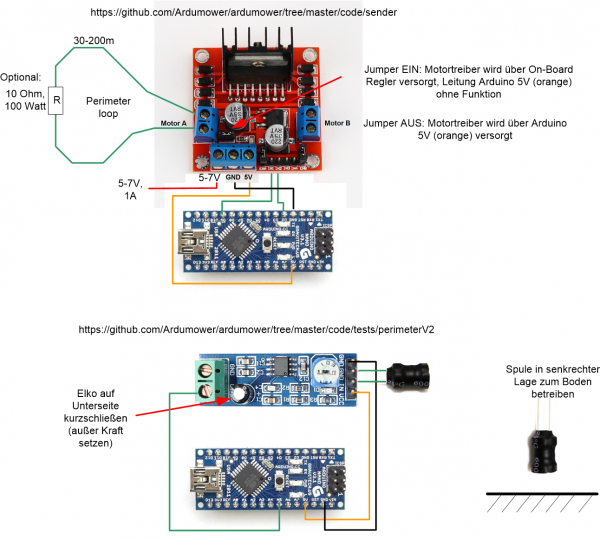 The limitations are: there will be no battery charging circuit, no charging station, and of course your wiring will not look as nice as a ready PCB :-) In Azruit Firmware (mower.h), choose PCB_1_2 and DRIVER_L298N. 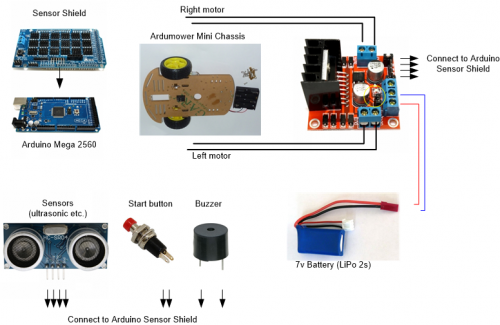 Ardumower mini chassis including motors etc. NOTE: Do not use more than 8 volt to operate the mini DC motors! Important: Connect motor driver GND to Arduino GND, so both share a common GND! If you connect IN2 to HIGH (5v) and IN1 to LOW (GND), the motor should rotate forward. If you connect IN2 to LOW (GND) and IN1 to HIGH (5v), the motor should rotate reverse. If you connect IN1 to HIGH (5v) and IN2 to LOW (GND), the motor should rotate forward. If you connect IN1 to LOW (GND) and IN2 to HIGH (5v), the motor should rotate reverse. This page was last modified on 21 August 2018, at 15:04. This page has been accessed 36,558 times.